Sixty Year 7 pupils joined the workshop, which took place on Monday 22nd January. 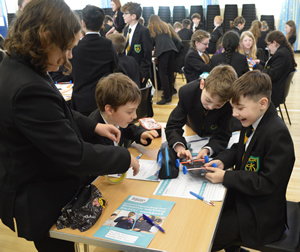 The youngsters enjoyed engineering challenges, which included being given materials to build, test and race their own electric vehicles, plus other hands-on activities. Careers information and inspirational films by engineers working in the field of local energy also feature at the event. Principal Mark Knapton enthused about the event. “We want our pupils to be inspired by the opportunities that are available to them,” he said. Year 7 pupils Jack McGill, James Parrott, Charlie Spalding and Euan Stansfield work together to construct a motorised vehicle at the STEM event at Healing Academy.